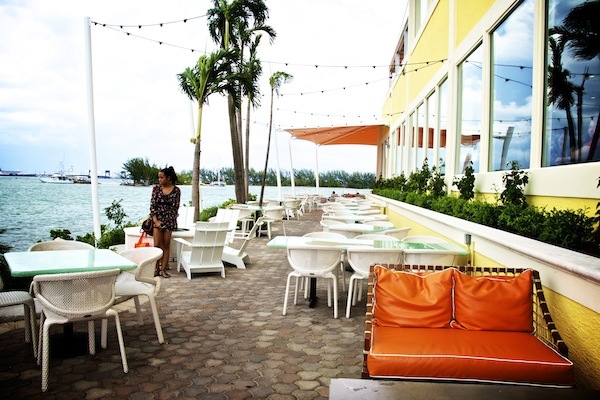 The Rusty Pelican is an iconic restaurant located on the island of Key Biscayne and stares right across the bay into Downtown Miami. The Rusty Pelican has been around for nearly 40 years but recently closed for renovations. We had to go check out the new menu and concept in this classic Miami food destination. As most times I had my little crew in tow – daughters Issa & Yazzy – who were more than happy to give me their unbiased opinions about the food. You know what they say about what comes out from the mouth of babes. Miss G. was also with us and she is a person who is honest to the bone and will taste and taste and taste again, then give a final verdict. Her taste buds are rock-solid. 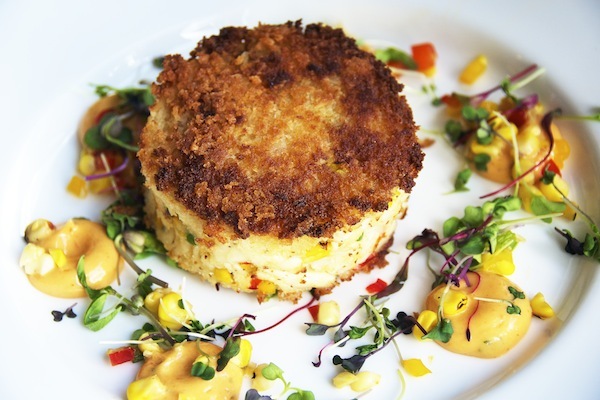 We started with a Baked Crab Cake made with grilled corn, peppers, chives and chipotle aïoli. The presentation was pleasing to the eye and packed with color. The top of the crab cake golden and full of crunch, the cake itself soft and silky, the micro-greens, corn and aïoli decorating the plate were like paint on a canvas. 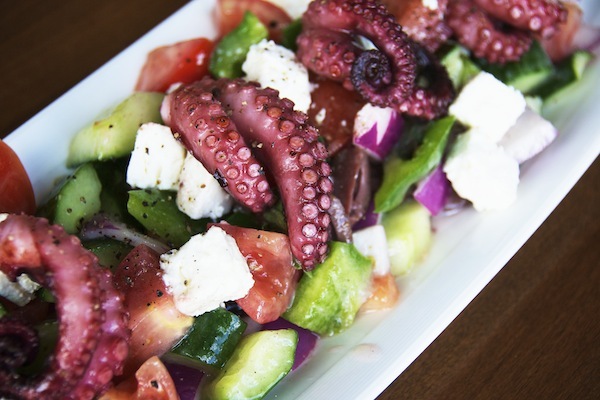 Our next arrival was the Baby Octopus Greek Salad which was composed of grilled octopus, feta cheese, cucumber, plum tomatoes, red onions, kalamata olives in a red wine vinaigrette. 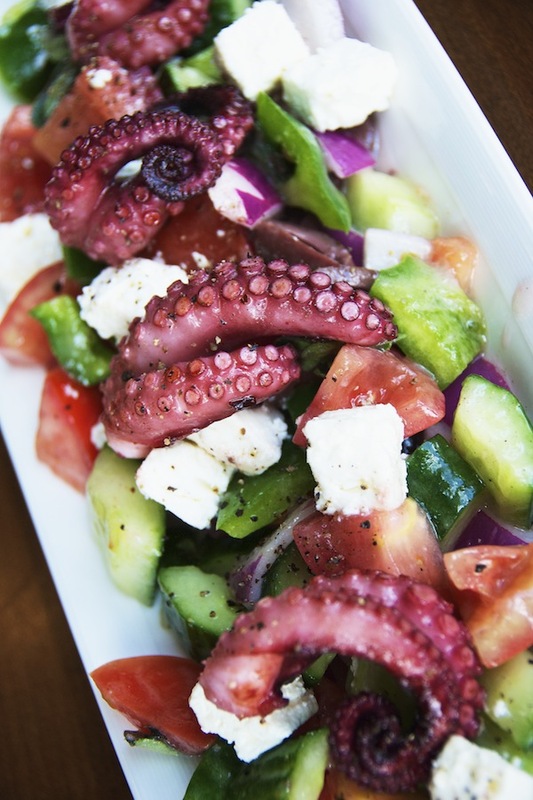 The octopus was fresh and bright, gently topping the salad and mingling perfectly with the flavors of the vegetables and feta cheese. It was ridiculously good. The Rusty Spider Roll was quite interesting, the main star of this roll being the soft shell crab. The flavor was good enough and the presenta- tion attractive. The crab itself would have been more enjoyable if it were less brittle-crunchy and a little more moist and soft. Miss G. had the G.L.T. Grouper Sandwich. 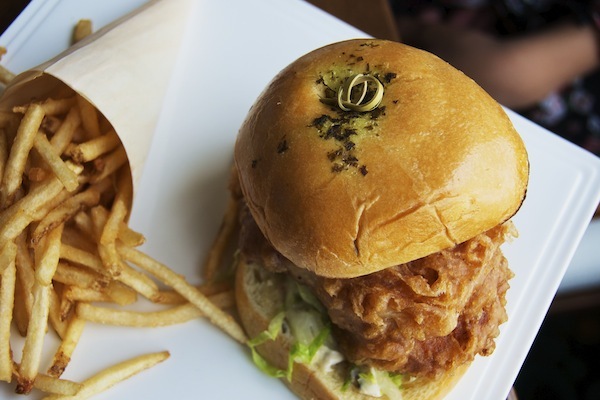 It consisted of beer -battered grouper, lettuce, tomato, caper-lime rémoulade in a brioche bun. Grouper, by the way, is a fish that has a mild but very unique flavor, somewhat of a cross between bass and halibut. Miss G. was pleasantly surprised and said that it was “yummy and rich”. I took a bite and I totally agreed with her. The pièce de résistance was the Florida Lobster Tail. Lobster is not everyday fare for us so this was a real treat. Issa ordered this dish so as usual; it was an ordeal to get her to share. I just got an itsy-bitsy taste and Miss G. just got to watch her devour it in less than 5 minutes. 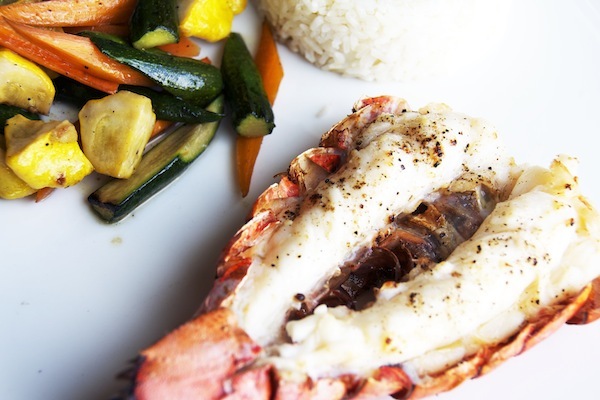 The lobster was succulent, moist and juicy, dripping with the flavor of the sea. One taste was not enough. Little Miss Yazzy ordered Chicken on a Stick from the Kids Menu. It came with fries so good that she ordered more. Yasmin was more generous with her food so I got to taste a whole chicken stick and it was good indeed. The dessert was an unexpected pleasure called Chocolate Sabotage. 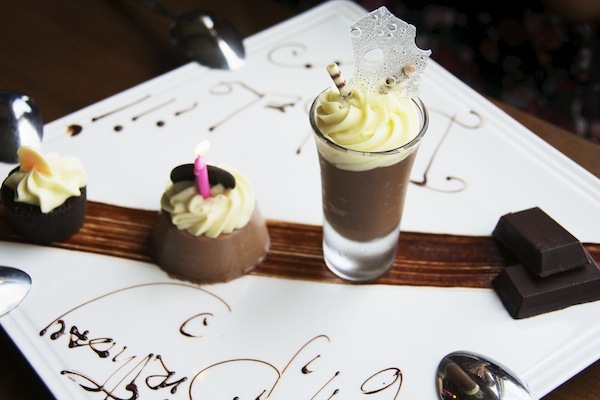 What to say about a chocolate mousse, chocolate lava cake, ganache and chocolate panna cotta all on one plate? The service was uniquely graceful, our waiter, being the personification of charm itself. The atmosphere was simple and casual, yet elegant at the same time, the restaurant being situated right next to the ocean being an extra bonus. The new Bar and Lounge were sparkling after the renovation and they offer a broad selection of cocktails, micro- brews and wines. The Rusty Pelican has an ambitious menu, which they manage to pull off fairly well. It is Modern American cuisine with an offering of small plates that are perfect for sharing and which showcase fresh seafood, locally sourced fruits and vegetables and prime beef. 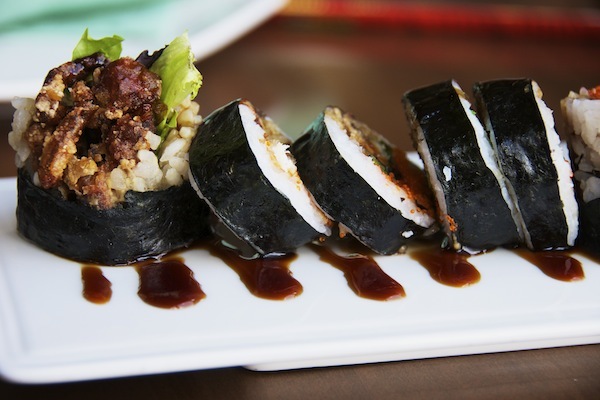 They also offer larger plates that cater to every appetite. Would we come back for another visit? Absolutely yes…but I am leaving Issa home: I want the lobster all for myself.